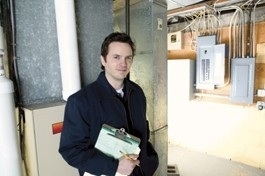 RISMEDIA, March 28, 2011—As winter gives way to spring, the threat of water flooding your basement substantially increases. As soil thaws it is overly saturated with water, and when a spring rain adds few fresh inches, the water finds the easiest path to flow —usually along your home’s foundation, down to the basement and into your sump pump basin. “If your sump pump fails, you’ll have a major water damage problem on your hands,” comments O’Donohue. A sump pump is a last defense against flooding, pumping out water from the lowest section of the basement before the water level reaches the basement floor level. As groundwater levels rise, it is diverted into the sump hole. When the water reaches what is called ‘the critical level,’ the sump pump begins to pump the excess out through a pipe that leads outside and away from your foundation. Just a few inches of water in a basement can cause tens of thousands of dollars in damage. According to the Insurance Information Institute, water damage— including sump pump overflow, frozen and burst pipes—has accounted for about 22 percent of all residential insurance claims. The average claim was $5,531. Unfortunately, many homeowners often overlook this on their policy and don’t have adequate protection against such damage. A standard homeowner’s policy will not have coverage for a sump pump, or any existing drainage system. This includes a back-up through any drain, sink discharge, toilet, or sump pump failure. According to the Chubb Insurance Group, 37 percent of homeowners have experience some type of home water damage and 51 percent say their losses were not covered by their insurance policy. The average lifespan of a sump pump is about 10 years, and they do eventually wear out. Fortunately, most sump pump problems can be avoided by a few regular maintenance checks and can easily be fixed by the homeowner. Here’s a list of common sump pump problems and solutions for each. Before performing any sump pump maintenance, be sure to unplug any electrical power leading to the unit. •	Debris In The Sump Basin. Always check to make sure that the sump pit is free from debris. Children’s small toys and debris from items stored around the basin can get into the unit and hinder the float mechanism, causing it to fail. Test the float itself, since they can burn out over time. Fill the pit up with water, making sure it both starts and stops the sump pump as designed. •	Inspect The “Check” Valve. Sometimes, the check valve can be improperly installed. The check valves are set up so that when the sump pump shuts off, no water will go back into the sump pump. The check valve’s arrow should not be pointing toward the sump pump. •	Clean The Weep Hole. Some pumps will have a weep hole, usually between the sump pump and the check valve. You can clean this weep hole out with a toothpick or other tiny object. Be careful not to break anything into the weep hole. •	Clean the Impeller. This is a small filter that can easily become clogged. If your sump pump has stopped running suddenly, or has been making a whining noise, this could be the problem. The impeller should be connected to the sump pump with bolts and may need a good cleaning to work properly. •	Sump Pump Odor. Typical odors are caused from the sump pump trap. The trap always retains some water, but when water doesn’t flow into the basin during the dry seasons of the year, an odor starts to form. You can eliminate the odor by using a bleach-water mixture to cleanse the basin. One part bleach to five parts water will work. You can also fill the basin with water until the sump pump engages, cycling the water and helping to eliminate the odor. •	Install a Back-up Power Source. Purchasing a sump pump back-up power supply or a generator is a great idea to avoid overflow when you have a power outage. Most power outages are caused by heavy thunderstorms that bring huge amounts of rain very quickly. This is when you need your sump pump most. If you lose power the back-up system will take over to get rid of the water as the basin fills up. There are also water powered back-up systems that tap into your home’s water supply to provide the energy needed to run the pump. It is good to invest in the purchase of a back-up system now, rather than face the costs of a flooded basement. For more information visit www.advantagerestorationandcleaning.com.